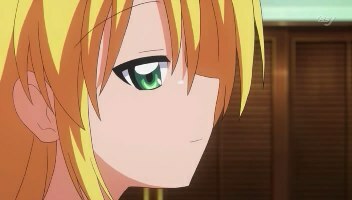 Zharth's Forum • View topic - Hayate no Gotoku!! 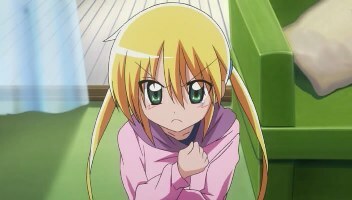 Post subject: Hayate no Gotoku!! Ok, last night I discovered a single episode Hayate no Gotoku OVA, which is also calling itself episode zero of the second season of Hayate no Gotoku. At first I was a little confused because, being a 52 episode series, I was sure that those 52 episodes already constituted two seasons worth of the series. Just when I thought I had the whole cour/season thing worked out, I get this four(?) cour season thrown at me? Well, it looks as though there will indeed be another season of Hayate no Gotoku to follow the 52 episodes we've (I've, at least) already seen. And, I'm not 100% sure about this, but I think the exclamation points at the end of the title serve to distinguish the seasons, i.e., Hayate no Gotoku! 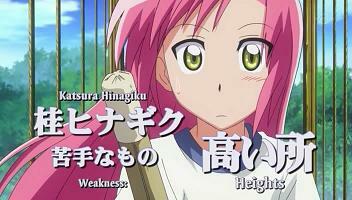 is the first season, and Hayate no Gotoku!! is the new, upcoming, second season. As for the OVA episode itself, as is the case with many OVA episodes these days, it's a fanservice episode, and in some respects, I suppose, an advertisement for the new season. It's another beach episode, but I think it's a lot better than the beach episode we got in the first season. I have to say, that previous beach episode was really sub-par. Not to say that beach episodes are the height of high-art, but even the fanservice was mediocre. Anyway, this new beach episode is a lot better. It still doesn't have an amazing plot, but it's entertaining, and the fanservice is better, I think. Anyway, it gets me excited for more Hayate no Gotoku. Even after 52 episodes (which I had naturally assumed, for some reason, would be all of it), I wouldn't mind seeing more. The characters are quite likable, and the humor is mostly pretty funny. Plus, I've grown fond of tsundere/hikikomori Nagi-ojousama. She's like a little ball of concentrated moe - but not the uber-cute moe, something of a more sinister moe, but moe just the same. So here's to the true Nagi-sama and the rest of the gang! Hayate should really learn how to knock before entering a room...still, I can't argue with the results. Post subject: Re: Hayate no Gotoku!! The fun begins anew! The second season proper is now airing. The first episode reintroduces the cast by way of a school marathon. 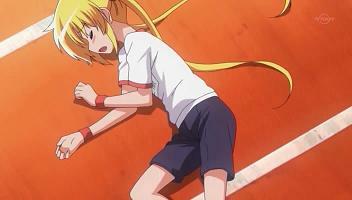 Of course, getting the hikikomori princess to even participate at all, let alone win the race, is the real challenge. The new opening is very pretty, if not as catchy as the old one. And Hinagiku fans will be most pleased with the new ending. Looks like Nishizawa Ayumu has a little brother? When did this happen? I suppose it's fitting for such a likable and able-bodied character to have an easily exploitable weakness. For those who may be curious about the series, but not interested enough to actually watch it , I have to say I'm really enjoying this new season so far. I've been hearing mixed reactions from people clearly expecting different things from the series, but I for one am pleased with the new focus and direction. In hindsight I guess it's kind of obvious that the first season/series kind of got carried away with "filler", but since I don't/haven't read the manga, I was just along for the ride. In any case, reports indicate that in this new season they're sticking a lot closer to the manga stories. What I do know for sure is that the show's famous humour has been toned down (though not completely eliminated), the plot is a lot less episodic than it was previously, and there's a lot more focus on romance and the relationships between the characters. For some, this is a bad thing. As far as I'm concerned, it's great. Nagi-ojousama is ultra cute in ep. 5, which includes a steamy (in both senses) bath scene - one that's heartwarmingly convincing and not just a fanservice gag. Ep. 6 starts off a Hinagiku subplot arc. The series also has more Nishizawa (including her previously unintroduced little brother) than before.